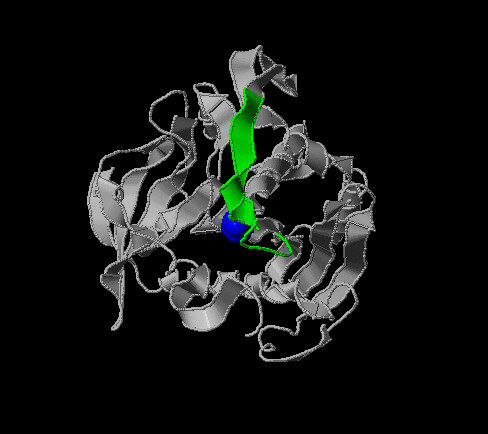 Enzymes for Cancer - The Lipase Enzyme. Researchers have noted for years a correspondence between low levels of enzymes and cancer. In fact enzyme therapy has been used with good results against cancers in Europe, and by some doctors in the United States. To literally digest cancerous cells. In the early 1900's a doctor in Wales, John Beard discovered that pancreatic enzymes destroyed cancer cells. Making some brilliant observations, he deduced that cancer cells come from stem cells that become uncontrolled stem cells. He noticed that the fetal pancreas starts working and secreting enzymes at the 56th day of gestation. Fetuses don't digest anything till they are born. Beard wondered why did the pancreas in the fetus start working so early? He noticed that the day the pancreas started producing enzymes was the day the placenta stopped growing. The enzymes stopped this rapid growth. In 1911 he tested pancreatic enzymes for stopping cancer in mice and it worked. Naturally and unfortunately, he was blackballed and died in obscurity. Decades later Dr. Kelly read about his work, and cured himself of cancer using pancreatic enzymes and started treating and curing many cancer patients using pancreatic enzymes. Dr. Gonzales, sent to investigate Dr. Kelly, liked what he saw so much that he also treats cancer using pancreatic enzymes. Unfortunately, very high amounts of supplemental emzymes must be used to have much effectiveness. And enzyme therapy, even in the over 120 capsules a day range only tests good to use on our testing scale, coming in at 350 for fighting cancer in general. The major reason enzymes levels become depleted is that we eat mostly processed, irradiated and cooked food. The digestive system was designed to process raw food. Raw food, when it is picked ripe, has enzymes in it that help break down that food in the upper stomach where it sits for 30 to 45 minutes. The enzymes in the food predigest that food. Then in the lower stomach the pancreas excretes more enzymes. When you eat cooked, irradiated and processed foods, the enzymes have been killed; the food does not predigest in the upper stomach. So when it reaches the lower stomach two things happen. The pancreas must make extra enzymes to try and break down the food. And often the food is only partially digested. The pancreas, after years of producing excessive amounts of digestive enzymes, gets its enzyme production signaling out of balance and doesn't produce enough of the proteolytic enzymes that are used to digest cancer cells, pathogens, toxins, fibrin in the arteries, and scar tissue. In addition, food that is not completely digested all too often makes its way into the bloodstream. Especially if you have leaky gut syndrome from candida overgrowth. This partially digest food is treated as a toxin, and the immune system has to get rid of it. This puts an additional strain on the already overworked immune system. Taking a good quality enzyme supplement with meals, like the P-A-L Digestive Enzymes, which has high levels of protease to digest protein, lipase to digest fat, and amylase to digest carbohydrates, helps break down food in the upper stomach. So that the pancreas doesn't have to produce extra enzymes, and food will be better digested. According to our testing, the major reason taking massive amounts of supplemental enzymes has been only somewhat successful, testing only at 350 on our scale, is that the enzymes are not 100% identical to human enzymes so they just don't work as well in the body. In addition, when you take supplemental enzymes, there is not as good a delivery system to direct the enzymes. They float around the body and digest whatever they run into. When your pancreas makes proteolytic enzymes, the immune system is there to take the enzymes where they are supposed to go. When we tested an elixir that both turns on production by the pancreas of proteolytic enzymes to digest cancer cells, candida, toxins, unwanted fibrin, scar tissue and to reduce inflammation also, it was no surprise that this elixir tested much stronger than using massive amounts of supplemental enzymes to fight cancer. It is a frequency enhanced elixir that tells your body, and specifically your pancreas, to make optimal amounts of additional proteolytic (protein digesting) enzymes to deal with all the various ill health situations that there are in your body. Your body is told to prioritize what needs to be focused on first. For example, the enzymes would be taken first to digest cancer cells rather than digesting scar tissue as it is more important to deal with the cancer. The instructions tell the body to make enough enzymes to digest all the cancer in the body and to direct supplemental enzymes to the cancer. It tests at 3300 in cancer healing power. The proteolytic enzymes will digest the fibrin coating on tumors, exposing them to the immune system. They will then digest the cancer cells, and also the candida that is in tumors. With the selection of supplements that make up the protocols we suggest, killing the cancer does not seem to be a problem. It tends to happen fast, within 4 to 6 months if a significant protocol is being used. Getting rid of those dead cells is a much slower process with tumors reducing in size very slowly all too often. The torrent of dead cancer cells the body must deal with when there is a lot of cancer being killed quickly can cause an increase in pain from lymph nodes swelling with dead cancer cells and pressing on nerves. And the liver, if it is in poor shape, can be stressed. The proteolytic enzymes will be digesting these dead cells too, and hopefully will be significantly increasing the speed of dead cancer cell destruction and removal. This action could increase the speed of tumor shrinking, and decrease the load on the liver as the enzymes will both be digesting the cancer cells and the toxins in them. The lymph system would have less to handle as the cancer cells are being digested on the spot. You can't do much better than this when it comes to both fighting the cancer and supporting the body. If you are not digesting protein well, you may need to supplement with a product like Fulvitea which has predigested protein peptides as a main ingredient. Your body can use these peptides to make enzymes -- which are made from proteins. Amino acids can be useful too. You could also take the P-A-L Plus, or other digestive enzymes high in protease, with meals, to improve protein digestion. Consider using Betaine HCL with meals to improve your protein digestion in yet another way. An additional benefit Proteolytic Boost gives you is that it tells the body to do a better job of directing supplemental enzymes (taken on an empty stomach) to get to where they need to go. This benefit is significant, powerful on its own, though not near so much as its ability to turn on proteolytic enzyme production by the pancreas. The best enzyme formula we've tested for working in synergy with Proteolytic Boost is PapayaPro. It has protein digesting enzymes in mature green papaya powder, toxin and junk absorbing capacity from wild crafted citrus pectin, and supports the anti-inflammatory action of Proteolytic Boost with several powerful, anti-inflammatory herbs. Typically use 2 or 3 bottles a month of Proteolytic Boost. However if you are suffering from pain or dysfunction, then increase the dosage to 4 to 6 bottles a month to more rapidly digest tumors and reduce inflammation. The main ingredient in this formula is mature green papaya powder. Papain is the principal and most active enzyme in this powder. Papain possesses a very powerful digestive action superior to pancreatin, or pancreatic enzymes. Changes in intestinal alkalinity or acidity do not interfere with the unique digestive activity of papain. Taken on an empty stomach, it will work more aggressively than even the pancreatic enzymes in attacking and destroying cancer cells. Taken with a meal, it will also help digestion. Papain, one of the most powerful plant proteolytic enzymes, will aid in protein digestion in an acid, alkaline or neutral medium. This is of vital importance if you are enzyme deficient or have low hydrochloric acid output in the stomach. The pepsin produced in the stomach for protein digestion is activated only in an acid medium. This requires a healthy output of hydrochloric acid which is insufficient in most people. Due to the powerful proteolytic action of papain, a more active digestant than pepsin, a major digestive problem for most people will be helped by the daily ingestion of mature green papaya powder. The second major cancer fighting ingredient in PapayaPro is Citrus Pectin. It has the potential to prevent metastasis, or the spread of cancer. Modified citrus pectin’s small molecules enter the bloodstream and act as decoys for lectins (cancer cell surface proteins), which are seeking the sugar galactose in cells. When lectins encounter the pectin, which also contains galactose, they attach to it as they would to a cell. Once bound to the pectin, lectins are unable to attach to other sites in the body and start new cancer colonies. Thousands of research studies have demonstrated citrus pectin's cancer fighting abilities. PapayaPro also contains other immune boosting and cancer fighting ingredients such as Mangosteen powder that act synergistically with the papaya powder. Use one to two of the 300 gram containers monthly on an empty stomach to fight cancer. Get an extra container if your digestion is poor and you want help breaking down protein. Energetic testing puts PapayaPro at 3100 for its healing power for cancer. Its papaya enzymes will, on an empty stomach, get into the bloodstream and work to clean it up. Most importantly, it will digest dead cancer cells that the other cancer supplements are killing. This will take a big load off the detoxification system and help to reduce detox symptoms and inflammation of the tumors. This will also help to reduce tumor size faster, another benefit from using enzymes for cancer. Their extremely high levels of protease will digest both live and dead cancer cells inside the tumors, helping to bring down tumor size faster. This is a much more powerful supplement when also using Proteolytic Boost. There healing power/cancer fighting power when using both is 5200. Use 2 to 3 containers for early stage or advanced cancers, depending on how much cancer there is. Use 4 containers a month if you have cancer that are causing a great deal of pain or dysfunction. This is an herbal formulation that uses an extract of the hirudin molecule from the salivary gland of Hirudo Orientalis, the Asian medicinal leech. Hirudin has long been recognized as one of the most effective ANTICOAGULANT AGENTS ever found. While the focus of Red 65 has been for clearing toxins from your bloodstream and cleaning the blood of fibrin so that it flows better, Red 65 has consistently testing in our energetic testing as the best enzyme supplement to use for digesting cancer cells. Live ones and dead ones. It does not reduce inflammation or fight cancer in other ways as PapayaPro does, so it is not as strong in our testing as PapayaPro, comin in at 1700. It is manufactured using pure Hirudin extract formulated with other proven ingredients such as soy bean oligopeptide, hawthorn extract and spirulina. Detox:: Helps cleanse harmful toxic elements including the fat and cholesterol content from your blood. Blood-thinning: Hirudin is a Natural Blood Thinner. Helps normalize blood sugar levels in your blood. Immunity boost: A healthy blood system strengthens your immune system. Revitalize: Helps restore your energy level, a naturally healthy blood flow in your body is like fresh clean oil in your car engine. It brings life and vitality to all the major parts of your body. To help bring down tumor size faster, use 3 to 6 bottles a month of Red 65. Take on an empty stomach so the hirudin enzymes get into the bloodstream without being used up. Use a bottle a month to aid your digestion, For this, take it during meals. It can also be used in place of PapayaPro or Red 65. A stack of research shows that enzymes, when taken on an empty stomach, will go into the bloodstream and clean it up. They will also digest and kill any cancer cells they run into. P-A-L Plus Enzymes a plant based digestive enzyme that can be taken with meals to digest food, and on an empty stomach in higher doses, like 4 to 6 bottles a month dosage, to digest tumors. This will also unstick clumpy red blood cells. Sticky, clumped up red blood cell clusters clog up capillaries and reduce circulation. So that cells cannot oxygenate properly. Which as you have gathered by now, contributes to cancer. Cancer tumors produce a thick fibrin protein to help protect them from the immune system. This also helps to stick the cancer tumor to wherever it is. Enzymes in the bloodstream can digest and dissolve the fibrin coating. Large amounts of enzymes would need to be taken, and they would need to be enzymes high in protease or nattokinase to break down the fibrin. Here is what you need to use if you are suffering from muscle mass loss caused by catabolic wasting. Catabolic wasting can occur in the end stages of cancer, aids and other serious illnesses. It is a major cause of death in cancer. No matter how much someone eats, how much nutrition they get, they lose weight and muscle mass. They are not able to metabolize or make protein. Recently scientists have figured out why this happens. Dr. Chojkier and Martina Buck, Ph.D., of VA, UCSD and the Salk Institute for Biological Studies, described the steps by which tumor necrosis factor (TNF) alpha, an immune-system protein, prevents the production of albumin. Low levels of albumin, a critical protein made in the liver, is a keynote of wasting. Drs. Buck and Chojkier showed that TNF alpha causes oxidative stress in the liver cell and also causes the addition of a phosphorous molecule to a protein called C/EBP beta, which normally joins together DNA in the nucleus of the cell to make other proteins, such as albumin. This extra phosphorous causes the C/EBP beta protein to leave the nucleus and go into the cytoplasm, where it can no longer make the albumin. "We found that this phosphorylation makes the C/EBP beta exit the nuclear area and go into the cytosol, where there is no DNA for it to bind with. This means it can no longer produce the protein," said Dr. Chojkier. And this inability to produce albumin leads to the muscle wasting and weight loss. The researchers found several ways of stopping the downward spiral caused by TNF- alpha. One way was to use antioxidants, especially ones that focus on the liver. This blocked the chain of events leading to the export of C/EBP beta from the nucleus of the liver cells. "If we block oxidative stress, we normalize everything," explained Dr. Chojkier. "C/EBP beta remains in the nucleus, it contacts the DNA, and proteins are produced. As you can see, protecting the liver and normalizing liver function is vital to reversing or stopping wasting. If you don't stop wasting, you won't make it. You'll basically end up being killed by the wasting before the cancer kills you. Fortunately, there is a protocol to stop catabolic wasting. You can notice improvement in a couple of weeks. Follow this protocol for at least two months to completely stop the wasting. Continue to take other anti-cancer supplements in advanced stage dosages while using this protocol. The most important supplement needed for dealing with wasting is UltraLiver12, covered in the Chemicals and Cancer page on this site. In addition, use equal number of bottles of Liver Balance Plus. They have a synergy with each other and supporting the liver in complementary ways. For a serious situation where the liver is not even able to make proteins, optimally use 2 bottles a month of each. Next, your body will use this to repair a damaged liver. This is the next important supplement you need to use to reverse catabolic wasting and to start gaining some weight. In fact, in is one of the most important products to use whenever to liver is poorly functioning. And whenever the cancer is so bad that you are essentially starving to death. The predigested protein it supplies is usable by the body without the liver having to convert amino acids to protein. And the regenerative factors in it help to stimulate repair. As the liver is so vital to health, if the liver is poorly functioning, the body uses the nutrients in Fulvitea to repair the liver. It does an excellent job. We have heard consistently successful reports of it stopping catabolic wasting and improving liver function - even with cirrhosis. In a life and death situation, be sure and use Endocar elixirto more rapidly improve liver function. Fulvitea has two basic functions. First it is a source of pre-digested protein that your body doesn't have to process to use. So you can actually start making muscle again. In addition it contains RNA and DNA repair factors to stimulate repair of the liver and also of cancer cells. It helps to normalize cancer cell function so the cancer cells die a normal death, apoptosis. This 1 pound container of powder contains Hydrolyzed Marine Collagen from wild fish which is 95% pure protein in a hydrolyzed (broken down) amino-acid form. In addition it has Fulvic Acid powder which intensifies the metabolism of proteins, increases DNA content in cells and increases the rate of RNA synthesis. The Green Tea Extract in it helps to drive the nutrients into the body. And does have anti-cancer benefit. It contains freshwater Diatomaceous Earth which will aid the detoxification process and fight cancer. Whole Colostrum powder (Grade A Bovine) supports the regeneration process and boosts immune system response against cancer. Small amounts of Vitamin C, Zinc, ProCoQ10, Manganese, Vitamin B6, Niacinamide, Selenium, Molybdenum, Chromium, and Vitamin E a blend of herbs that also support the regeneration process. Fulvitea also contains NutraFlora - a short-chain Fructooligosaccharide assisting in the absorption and utilization of minerals and amino acids. It passes, intact, through the stomach and small intestine to the colon, where it is fermented by beneficial bacteria into short-chain fatty acids. These lower intestinal pH to an optimal level for keeping calcium, minerals and amino acids in solution for a longer period of time, making them much more absorbable. Absorption is further enhanced by Aulterra magnetic powder from an ancient seabed mineral deposit. Aulterra supports the utilization and effectiveness of nutraceuticals and herbs in the diet. And Pascalite - a rare, calcium bentonite/montomorillonite, non-swelling clay, which has a long history of health uses. Pascalite provides trace minerals in oxide form, so they are easily assimilated. Use 2 containers a month if you are not in too bad a shape, and 3 containers a month for more serious nutrient support and liver repair. Its energetic testing for helping stop catabolic wasting is 1700. We find it works best to shake or blend the powder into a smoothie or some sort of drink -- but not a protein drink as it is best absorbed on an empty stomach without other proteins. There is a well-known product that has been fighting cancer and used for wasting for years. It is a fermented soybean protein drink. For wasting and advanced cancers you need to drink a bottle a day of this bad tasting drink. Quite expensive too at $50 a bottle. For catabolic wasting this fermented soy drink comes in at 1500, not much less than Fulvitea's 1700, but much more expensive. Healing Rescue is a vibrational, energetic, frequency enhanced water elixir that supports the body and helps to reduce symptoms that occur during both mild and acute ill health situations. This can be something as simple as decreasing the symptoms of colds and flu. Or as serious as helping to support the body when in catabolic wasting or to better deal with chemotherapy. Healing Rescue is in the same category of support as are products like Rescue Remedy or Acute Rescue. However, the technology used to make it is much more powerful and it contains many specific instructions that can produce superior results for many more ill health situations. It is designed to start working immediately to help you get through a physical or psychological health crisis. It works on reducing symptoms, increasing a sense of calm and wellbeing, and more importantly supporting the body so that it can better handle the health crisis that is happening. For catabolic wasting or to deal with the ravages of cancer, use 2 bottles a month of Healing Rescue. If you with to use it to prevent colds or deal with an injury, just use it as needed. In our energetic testing Healing Rescue comes in at 880 for supporting your body while dealing with cancer, chemotherapy or catabolic wasting. Three bottles of this frequency enhanced water elixir is a month's supply. It stimulates cells to repair themselves and more as it supports the body several ways. Endocar has been energy infused with instructions to support the body when it is in extremely poor health -- at the end stages of life. These instruct the body to optimize function of all detoxification organs, to stop catabolic wasting, to increase nutrient absorption, to fight infections more effectively, to increase cellular life force energy and more. It's base of Regenerative Elixir stimulates regeneration of cells and organs. When someone is in catabolic wasting, the fundamental action to get out of it is to repair the liver so that it can start processing proteins again. Endocar turns on this repair process as its Regenerative Elixir base carries specific energetic vibrational frequencies that signal or turn on the regeneration and repair process in your body. In addition, Endocar supports the overall health of the body and help to prevent some of the other causes of death that happen in end stage cancer. When using 3 bottles a month of Endocar, you will take 4 squeezes of the dropper bulb in the morning and 3.5 squeezes in the evening. On its own, this quantity of Endocar tests at 620 for helping stop catabolic wasting. Use UltraLiver12, Liver Balance Plus, Fulvitea as the basics for catabolic wasting. You should see results quickly, and be able to successfully stop catabolic wasting in its tracks. One of the more common recommendations for catabolic wasting is t the drug hydrazine sulfate. There is some evidence that it can help cancer patients gain weight and improve the cachectic state. The drug is by prescription and should be given by a physician familiar with its use, as it can be toxic. Do not use narcotic painkillers or benzodiazepine anxiety-reducing agents at the same time. In our energetic testing, hydrazine sulfate tests at 550 for helping with catabolic wasting. Being toxic, hydrazine sulfate puts more stress on the liver which is fundamentally not the right action as the liver is already too stressed to work properly. If your liver is able to make proteins, and you just need support, instead of Fulvitea, you can use CellPro. Most of the time weight loss is not caused by catabolic wasting. Rather it is caused by not eating enough because of feeling bad, either from the cancer of the chemotherapy, or from changing diet radically and not getting enough calories because you've cut out carbs. If someone is using BLA and Glutam, they can get away with increasing carbs. Even though those carbs will feed cancer cells, BLA stops the cancer cells from pumping out the lactic acid that the cancer cells produce when they metabolize those carbs. So the cancer cells becomes more toxic and sick. The best supplement we have tested for increasing over all health improvement, weight gain and recovery is a new one called CellPro. Starting with organic plant protein, ingredients to increase Nitric oxide production and to support cell and brain function are added to it. Making it a super supplement. The protein is boosted with a combination of Beta-Alanine amino acid to help increase muscle strength and Citruline Malate to increase energy levels and to eliminate ammonia. These along with many other nutrients, work to increase Nitric oxide production which among other benefits, increases circulation. Nitric oxide will fight cancer too. CellPro tests at 1600 for its cancer fighting abilities and for its ability to improve strength, increase muscle mass, and improve cellular and brain function. This elixir optimizes function of cellular metaoblism processes to improve and optimize metabolism by increasing cellular energy to the greatest possible levels, while also improving detoxification of cells. What is especially valuable about Metabolic Energy Boost are its instructions to enable your body to process and burn fats more effectively, rather than relying on blood sugar for energy. This will significantly increase the amount of energy your cells can produce as fat holds much more energy than other sources. Metabolic Energy Boost is a highly valuable elixir for anyone experiencing low energy and fatigue. It will help keep your body going when it is doing poorly. Having covered Enzymes for Cancer, next we will explore how energy can lead to cancer, or help you beat cancer.